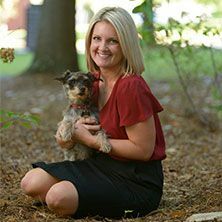 Amanda Carter joined Southern Veterinary Partners as a Payroll Specialist in 2018. Amanda is a Georgia native (Go Dawgs!) and holds a Bachelor’s Degree from the University of West Georgia, Richards College of Business. Amanda began her career as an Operations Analyst in the construction industry before transitioning to a payroll tax specialist. Amanda has experience in Multi-State Payrolls, Certified Payrolls, Payroll Taxes, Benefits and HR. She is a proud board member of the Birmingham Payroll Association and has over 7 years of experience working in accounting, finance, tax and payroll. Outside of work, Amanda resides in Hoover with her daughter and dog, Wrottie. She is an avid rock climber, runner and adventure seeker. In her spare time, she leads a church small group and volunteers within the Birmingham community. She loves to live life to the fullest and enjoys all nature has to give.